“Their brains have been bred right out of them, they’re really nasty and stupid.” That’s what Michael Pollan had to say in a recent interview in Smithsonian Magazine about chickens like Edith, pictured here, whom I recently rescued from the trash. After only 5 days, she has become attached enough to me (someone who does not view her as trash) to rest at my feet, and to wait by the door for my return. 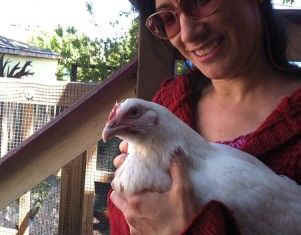 Edith, our latest rescue, is a "broiler" hen and one of the sweetest and smartest birds we’ve met in a long time.